In an effort to offer a new professional development opportunity for teachers engaged in robotics education, VEX Robotics, the Southeastern Center of Robotics Education (SCORE) and the Robotics Education & Competition Foundation (RECF) have teamed up to host a yearly conference. The first ever Southern Regional VEX Robotics Conference was hosted on Jan. 8 in the Auburn University College of Sciences and Mathematics’ (COSAM) Sciences Center Auditorium. “Based on the feedback received from the participants, the conference was a huge success,” said Mary Lou Ewald, director of outreach for COSAM. The conference featured various workshops, networking opportunities, Q&A sessions and a luncheon. The luncheon, hosted by VisualEdge & Learning Labs/Applied Technologies, featured keynote speaker Adam Freeman, vice president for product development at VEX Robotics. “As the VP for Product Development at VEX Robotics, Adam is in a perfect position to describe the mission and goals of VEX and also project future plans for new products that will enable teachers to enhance robotics education in their classrooms,” Ewald said. Freeman, who has worked for VEX Robotics for the last year, said he knew that he wanted to be an engineer at the age of 13. That’s exactly what he did, but after 10 years with the company and less design opportunities than he hoped, Freeman said he wasn’t feeling fulfilled. In 2005, a coworker asked him if he would be interested in working with a robotics program and that’s when Freeman changed careers. Before moving to a career at VEX Robotics, Freeman was vice president of engineering for HEXBUG, leading their team of engineers to develop creative products that give kids a positive experience with robotics at a young age. Freeman said throughout his career in robotics, he has enjoyed watching the students start with nothing and learn the abilities to build something. “To be able to work with them and build them up and give them the problem solving skills, give them the critical thinking skills and work with them on a day-to-day basis on something that was very hard and challenging was something that was really, really inspiring to me and I know it was inspiring to them,” he said. Freeman said VEX Robotics’ goal is to provide the tools to educators and mentors that will inspire students. Freeman spoke about new VEX programs offered such as VEX Coding Studio, V5, STEM Labs, and the new Girl Powered initiative which promotes more female participation in robotics. VEX begins working with students in elementary school and continues through high school and into college. Freeman said some skills he has seen students learn while working in robotics include time management, critical thinking and communication. Freeman added that these skills will help prepare these students for future careers in computer science, automation, manufacturing and artificial intelligence. The Southern Regional VEX Robotics Conference will continue to be an annual event. The next conference is set for Oct. 10-11, 2019. 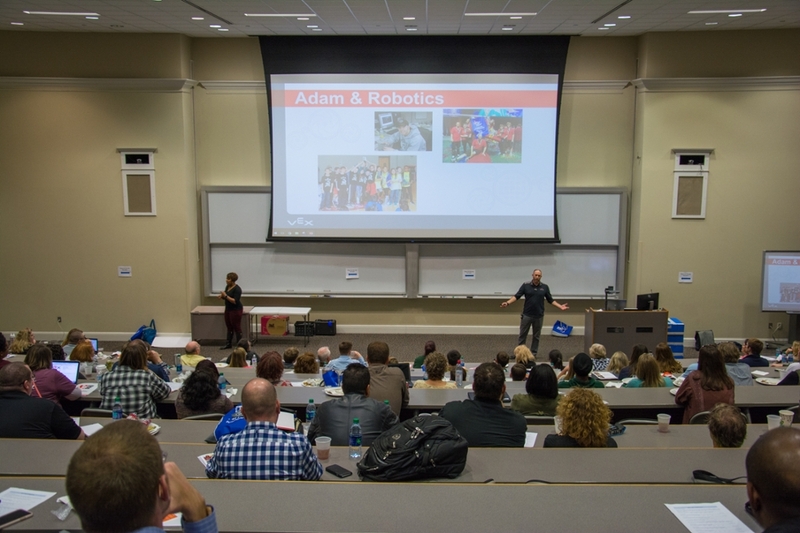 Adam Freeman, vice president for product development at VEX Robotics, was the keynote speaker for the conference.